In an interview with Behindwoods Air, Anbumani Ramadoss, a star candidate, spoke about various issues concerning the opposition and his plans for people welfare this election season. The interview opened with Anbumani answering about the controversies after their coalition and the press meet that followed. He blamed it on DMK for bringing people to trigger during the meet. He added that why would journalists get angry over a party's decision. He also said that people have accepted them but it is just the press that is questioning them. When asked about how they plan on convincing the govenment of NEET, he said it was Rahul Gandhi and Stalin that brought NEET and he also spoke about how they have difference in opinion about NEET. When asked about the controversial words he spoke, he said to ask about issues and spoke about Thirumavalavan and DMK coalition and how they are isolated by the others. Anbumani Ramadoss also spoke about how DMK gives seat for candidates who are rich or sons and daughters of past MPs, MLAs. He also said that people in DMK claim that it isn't Stalin who is running the party, it is 4 youngsters that are controlling the party, it is all about money to them. When asked about why people should vote for him, he spoke about the welfare schemes he has brought to the people in the past and what he is planning to bring in the future for the people. For detailed interview, please watch the video. This page contains news relating to various facts and events. The views are generally about current affiars and general topics in diversified areas such as political, international, national, and regional issues, sports, health, travel, lifestyle, technology and business. People having similar interets on the above topics will find this page useful. 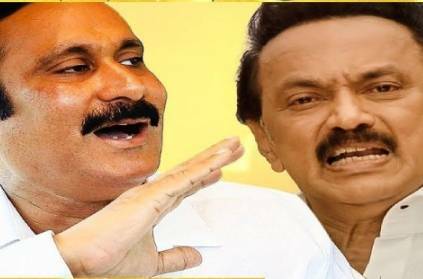 "It isn't Stalin who is running DMK" Anbumani Ramadoss Exclusive | Tamil Nadu News.